Mark Saurer knows the importance of a good umbrella. An umbrella creates a dry, comfortable space around the head and upper torso that a rain jacket can never provide. It also has other uses. Keeps items dry while digging around in your pack during a deluge. Offers shade on sunny days when you’ve run out of sunblock. Allows you to hike longer without a rain jacket, thereby reducing the damp clamminess that occurs during humid weather. (Especially on climbs). Have your own uses? Please submit them here. What about wind? True. No umbrella can withstand a strong wind. That said, we find that we’re able to use our umbrellas in all but the most foul weather conditions. What about lightning? When in doubt, put the umbrella away. 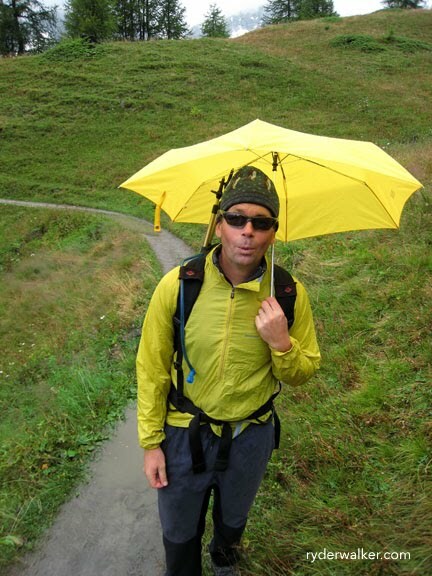 Or consider the Chrome Dome Trekking Umbrella from GoLite. It’s spendy, but it’s fashioned without metal. Though we never suggest leaving your rain jacket at home, we do recommend the addition of a small, lightweight umbrella in your pack. Our guides swear by them. If nothing else, it can make a rainy day seem a little brighter. Image: Mark Saurer, an umbrella believer.